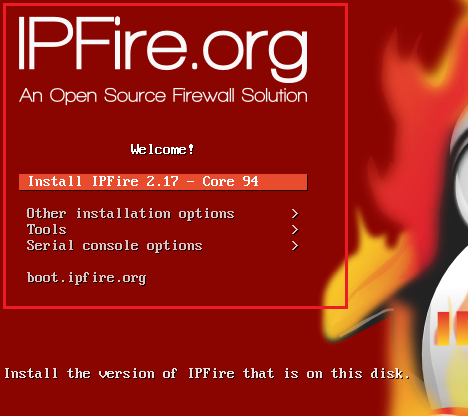 IPFire is an open source firewall distribution. It can be used as a firewall, a proxy server or a VPN gateway.It has following features. IPFire is forked from IPCop and Endian firewall distro's. Installation and basic configuration of firewall is given in following section. 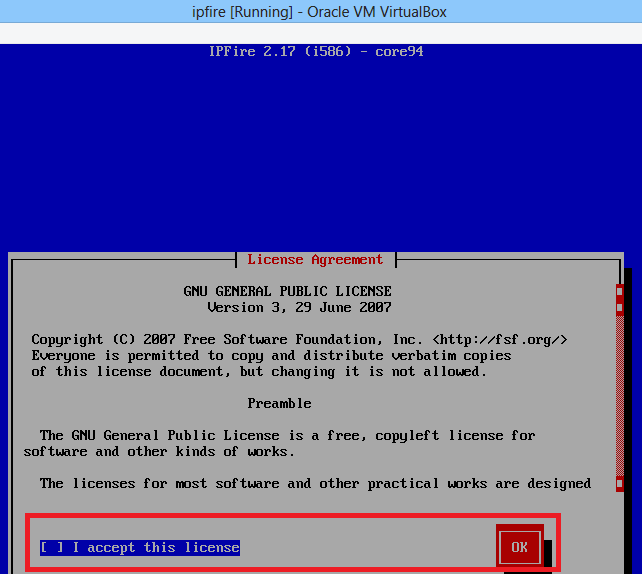 In this tutorial, IPfire firewall will be installed on the VM, created on the Virtual Box software. 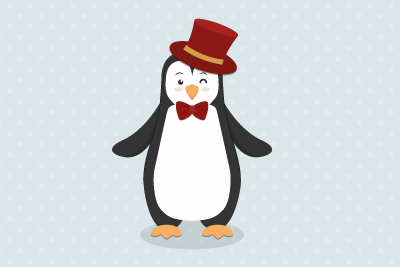 The detail of our VM is given below. 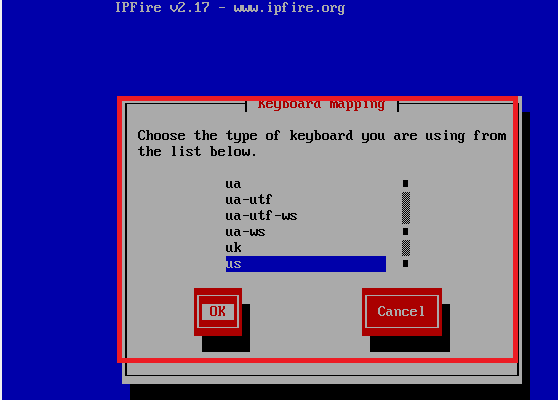 After clicking on start button, following window appears for IPfire installation. Press "Enter" button to start installation procedure. Select the desired language from the given list. Press "Enter" button to start installation and accept GPL license. GPL license acceptance is shown following. 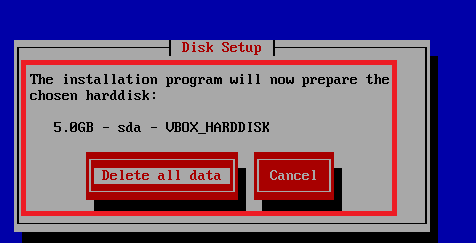 After GPL license acceptance, windows appear for the partition of hard disk and filesystem. Ext4 file system is selected in this installation of IPfire. 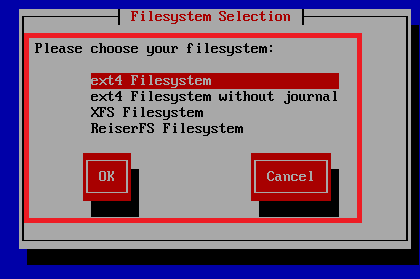 File system selection is shown below. 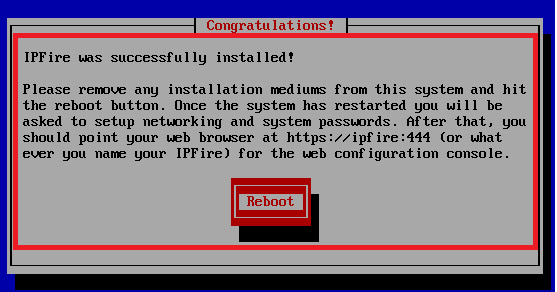 IPfire installation progress is shown in the below figure. IPfire firewall successfully installed on the VM. 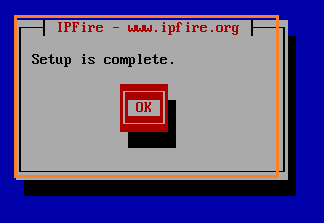 After reboot, basic configuration of IPfire firewall will be done. 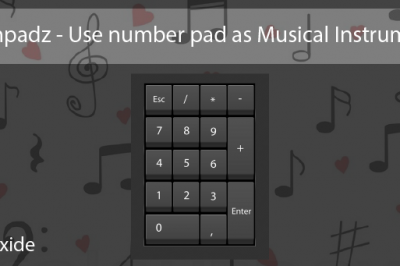 First of all, keyboard layout and time zone are selected. 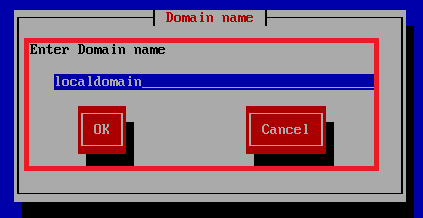 Host name and local domain setting for IPfire firewall. Password setting for root user which is used for CLI access of IPfire. Password setting for admin user which is used for web access of IPfire. IPfire supported zones are shown in the following figure. 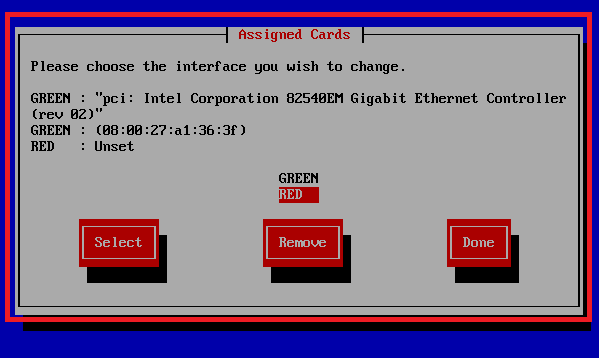 In a standard IPfire firewall installation, Green + Red means 2 Networks. 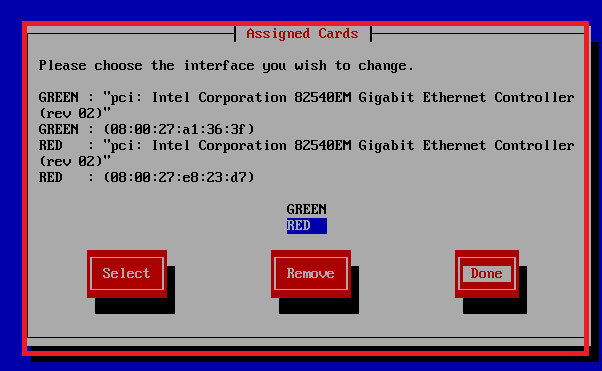 Green network for home or LAN side and Red network for internet/external connection. Usage of each zone is given in the following table. Assignment of available NICs to GREEN and RED zone is shown in the following snapshots. 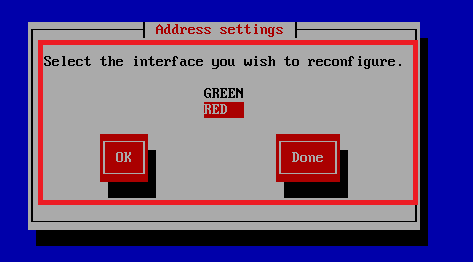 Interfaces assigned to both GREEN and RED zones are shown in the below figure. IP address setting for GREEN zone is shown below. IP address setting for RED zone is shown below. Assigned Static IP address and net mask are following. 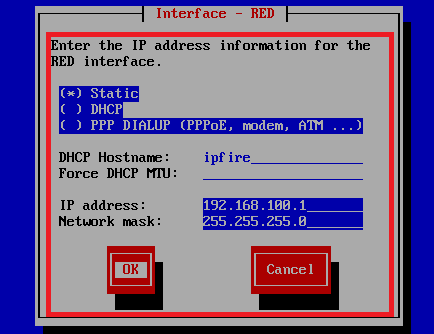 However, DHCP and PPP DIALUP (PPPoE) modes are also supported on RED interface for IP assignment. 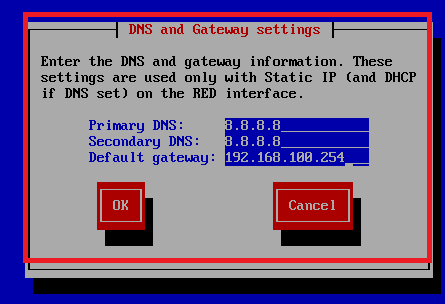 DNS and Gateway setting for RED interface are shown in the following snapshot. 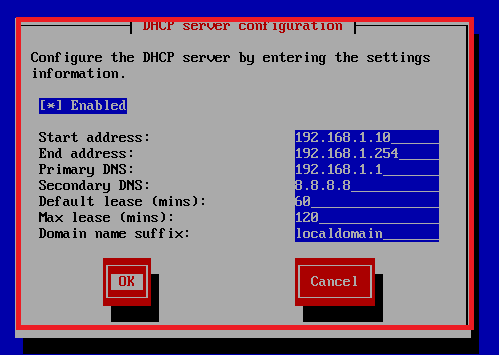 DHCP configuration on the GREEN interface for automatic IP assignment is given below. 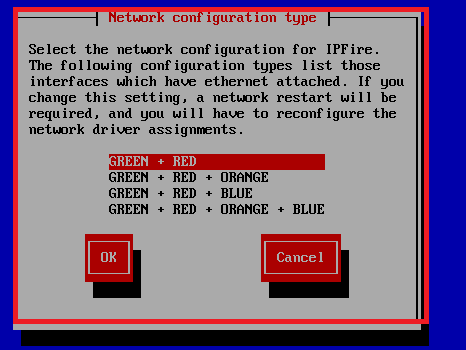 After DHCP configuration, basic setting of IPfire are complete. 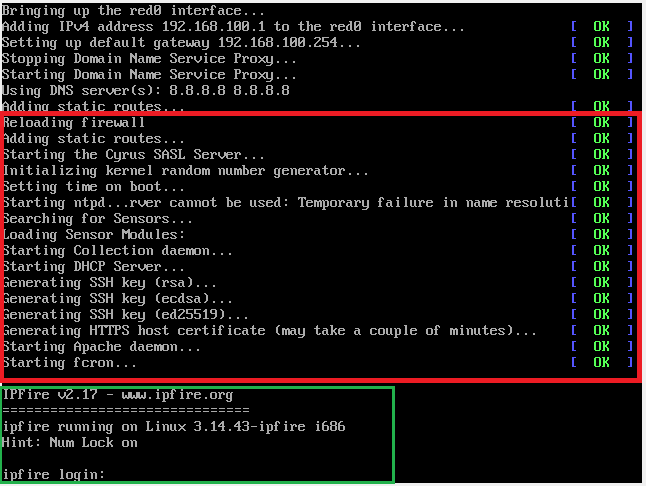 IPfire will reboot to apply changes and gives CLI access to user "root". 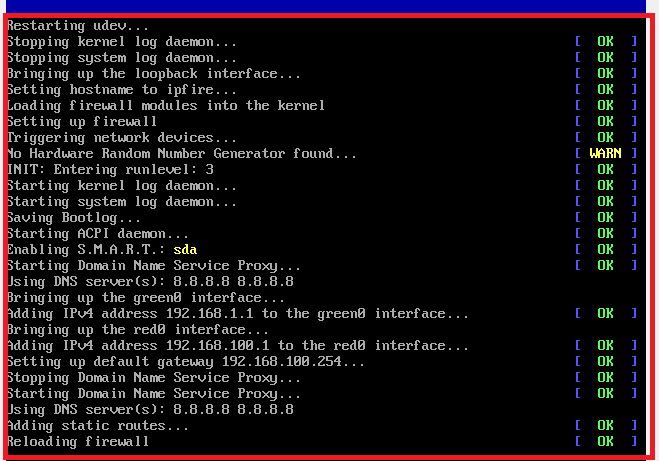 To access CLI , enter password for user "root". 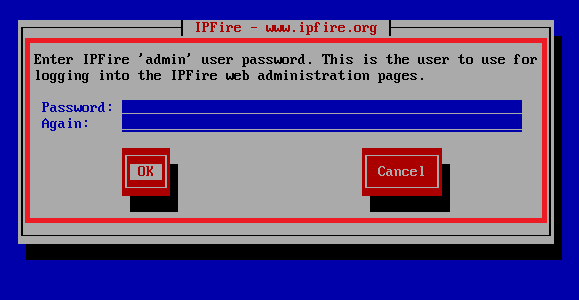 Web Access of IPfire is required for further configuration. 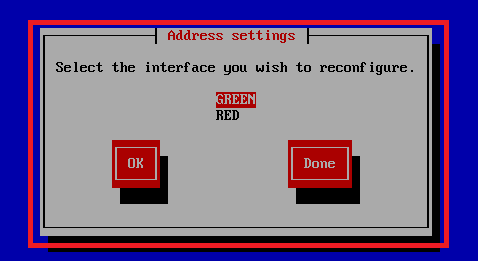 It is also used to configure firewall rules, snort configuration and VPN setting etc. 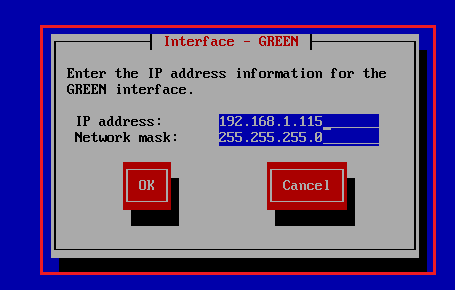 Enter IP address of GREEN interface along port 444 for web interface access. 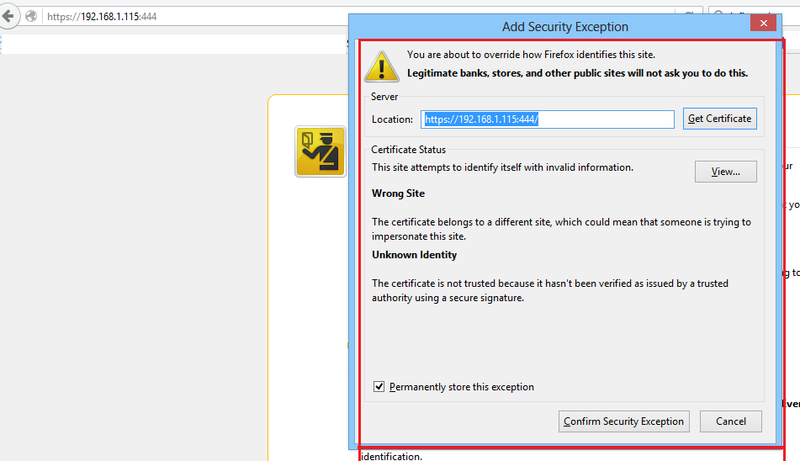 All web browsers gives exception due to untrusted certificates. Therefore accept the exception to view the web pages. Enter password for "admin" user to access the pages. 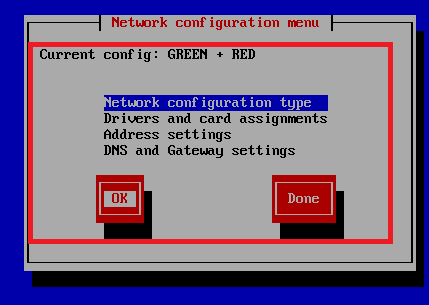 After correct username and password, following main dashboard appears, which shows the network configuration (IP addresses on RED and GREEN zones). 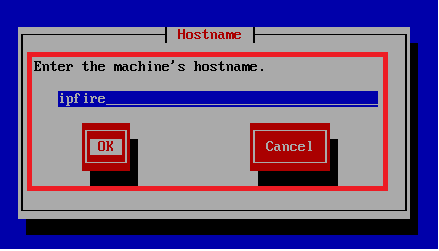 This menu is used for basic setting of the IPFire machine such as enabling ssh access, backup and setting web access password etc. 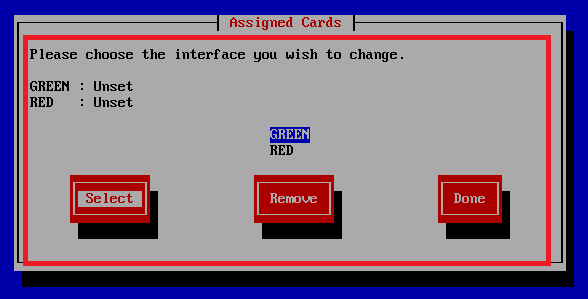 System sub menu is shown in the following figure. In this menu, firewall administrator view the status of system resources such as RAM & CPU, internal and external network, entropy for TRNG and statistics for VPN's. Services such as VPN which include IPsec & OpenVPN , intrusion detection, QoS , time server etc are listed under this menu. Main feature of IPFire distribution is providing firewall feature. Administrator or user uses this menu to push iptables rules on back end. Pakfire is used to install Addons/packages on the IPFire machine for more feature. As shown in the following figure that, logs of services such has IDS, firewall, proxy and system can be view from Logs menu. In this article, our focus was installation and configuration of another open source firewall, IPFire. 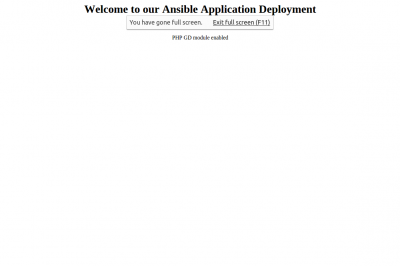 It is forked from well-known open source firewalls IPCop and Endian. It provides high availability, usage of TRNG and AES-NI features. How to config loadbance with ipfire? Can you share more details about your query ? i will write more articles on IPfire feature. 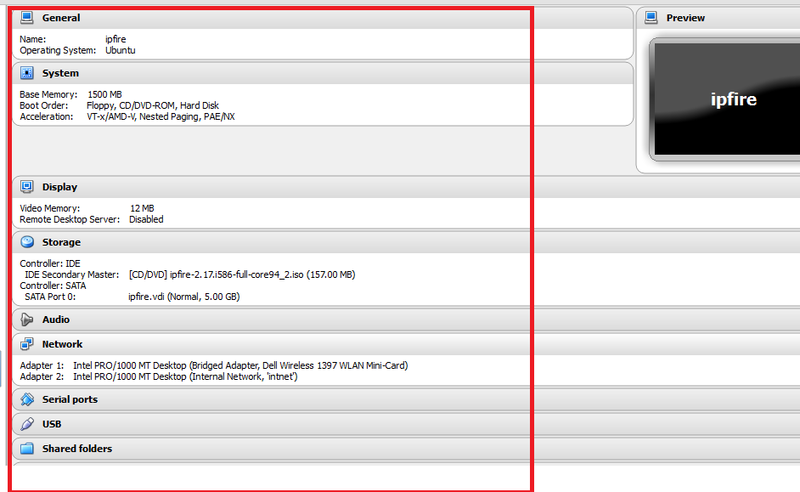 VirtualBox setup is nic1=bridged nic2=internal network (like yours) my local net is 10. * Installed v2.19-core120. then I try https://192.168.1.10:444 ... problem loading page, connection timeout.